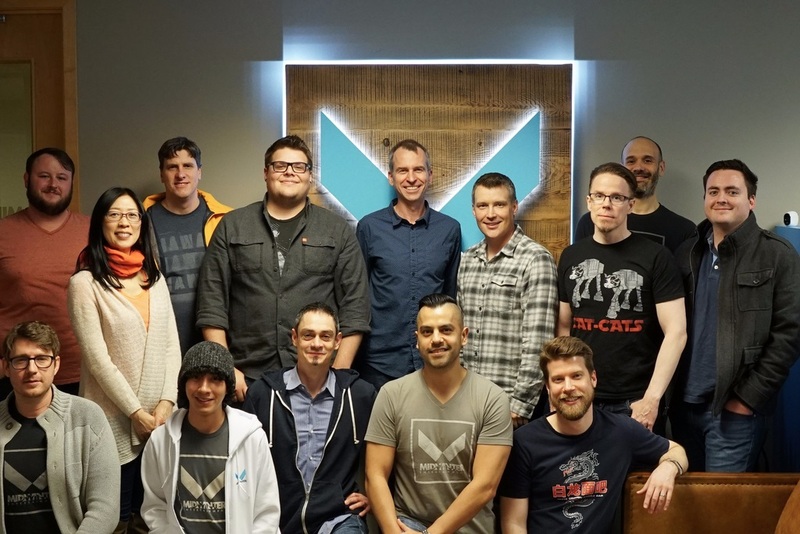 After more than a year at work in "stealth mode," Midwinter Studios announced its arrival today with the news that its debut project is being built with Improbable's SpatialOS cloud platform, with Improbable providing both technical and funding support for the project. Based in Kirkland, Washington, Midwinter boasts a roster thick with Halo veterans. Three of the four co-founders came from 343 Industries. Midwinter CEO Josh Holmes was studio head and creative director at the Halo studio, while chief technical officer Fredrik Persson was 343's principal software engineer and engineer Peter Burzynski was the principal engineer on 343's multiplayer, networking, and UI team. The fourth co-founder, Daryl Anselmo, arrived at Midwinter via Zynga, where he was creative and art director on Farmville 2. In total, the studio's website shows a team of 17 developers. The studio's first game is called Scavengers, described as a "multiplayer 'co-opetition' survival shooter" where competing teams explore a world populated by AI adversaries of distinct factions. Midwinter said it will be built using Unreal Engine and game design principals seen in the previous work of its team, specifically Halo 5's Warzone mode. "We started Midwinter with the goal of creating innovative, shared experiences for millions of players around the world," Holmes said. "When we introduced Warzone in Halo 5, it represented the pinnacle of blended PVE/PVP. Now with SpatialOS, we have the ability to push the boundaries of 'co-opetition' gameplay in Scavengers, with teams of players competing as armies of smart AI move intelligently across the map, hunting down players and each other." Scavengers is a first for Midwinter, but it's also a first for Improbable. It marks the first time the SpatialOS company has provided project funding for another studio. "We're passionate about making the next generation of online games possible and we're taking steps to help studios with outstanding teams and exciting visions make games that would have previously been impossible," Improbable CEO Herman Narula said. "Often, innovation comes from studios like Midwinter: talented, experienced designers and developers with a track record of delivery at major studios, who want to create something truly groundbreaking. "We chose to partner on Scavengers because we believe that Midwinter will produce a great game and a great demonstration of SpatialOS in action, and also help us to optimize our own tech and tools for this kind of action-packed, session-based gameplay. A partnership like this is designed not just to help a great game get made, but to make it easier for other studios to make great games."